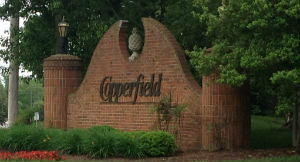 Homes for sale in Copperfield, a community in Louisville, KY, are displayed below and updated daily from the MLS. For more information on any of these Copperfield homes for sale, just click the "Request More Information" button located on the detail page of each listing. And, for your convenience, register for a free account to automatically receive email listing alerts whenever new homes come on the market in Copperfield that match your specific criteria. If you are planning on selling your Copperfield home, and would like to determine the value, click here. Copperfiled Subdivision in Louisville Kentucky is a great place to live, it's close to Louisville's newest park which is greatly appreciating its property value. Coppierfield offers a nice playground, lighted streets, sidewalks and an outstanding pool. The homes are unique and offer a wide variety of architecture styles. Another cool fact is all of the streets are named after characters fromCharles Dickens's book David Copperfield. If you would like to see a list of homes for sale in Copperfield Subdivision you can find a full list below.